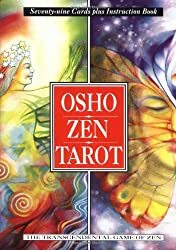 I was browsing a local metaphysical shop, looking for a new “friend” if one happened to speak to me, and the fella working there was SOOOOOO excited about how great the Osho Zen deck was, I ended up buying it. His joy at sharing something he obviously loved was infectious. I thought it was a beautiful deck, but wasn’t sure I’d be able to read with it. I actually bought it to ride his happy wave. It is beautiful, though. I had to give him that. The artwork is colorful and striking. Many of the images Eastern-flavored, using highly saturated colors and some modern imagery. The pictures are engaging and expressive. It IS the kind of deck you may get just to admire, because the cards are just flat out engaging. The teachings espoused in the card interpretations are from Osho, a Zen master. Osho himself was quite a colorful character, controversial but interesting. Nonetheless, I was annoyed discovering an extra Major Arcana card for “The Master,” representative of transcending the cycle of life and death and illustrated by a painting of (the deceased) Osho. This struck me as contrived and self-indulgent, considering the concepts within the deck and book should already be enough to introduce his perspective. Y’kno? But it’s easy enough to nix that card if you don’t want to participate. The suits are Fire, Water, Clouds (Air), and Rainbows (Earth), represented by elemental icons. For each card, the companion book has black and white card images, a selection from Osho relating to the card’s meaning, and a less poetic suggested interpretation. Some of Osho’s selections may require extra consideration if you have little exposure to Zen philosophy. No particular attention is paid to astrological correspondences beyond that inherited by the semi-traditional card associations. I actually had the deck for several years before I learned to read with it. I was concerned I’d have trouble interpreting it. Once I got to know the cards a little better, I found I could indeed get sharp and helpful readings. Card interpretations are often similar to the Rider/Waite, but sometimes focus on specific aspects or angles of the traditional meanings. Suits are represented by the colors in the diamond icon at card’s bottom, and court cards are designated by their corresponding elemental symbols to make identification easier. I find this deck to be direct, very much on the blunt side. I don’t consider that a criticism, personally. I highly value directness. I also am a fan of Zen—I find freedom in detachment and see gifts in mindfulness. But not everybody feels the same, so bear in mind your own preferences when considering this deck. I would recommend this deck for people who like Zen-flavored perspective, prefer straight talk and are willing to put in the time needed to get to know these cards. In return, they’ll return vivid imagery, new perspective, and to-the-point advice. Anyone work with this deck? Your thoughts? p.s. Feel free to request this deck when booking a session with me. I wish I could remember why I decided to pick up the Osho Zen deck, but I don’t. Four years later, this deck is a close friend, and my go-to for readings. I only have two decks (well, three, if you count that Celtic Dragon deck I inherited somehow, but have no desire to touch), so that’s not saying alot, but I do love this deck. I had only the smallest of experience when I picked it up, and I was able to start reading almost immediately. I was already deeply familiar with many of the concepts used in the deck, and was able to quickly get up to speed by studying the book. The deck is beautiful, and evocative. I also find it direct, but gentle at the same time. Due to my own (shrinking) unfamiliarity with traditional Tarot symbolism, I do tend to read the cards at face value, and allowing my own intuition to fill in information that is not evident. I know using reversals isn’t for every reader, but I think this deck lends itself to using them. And yeah, I tossed “The Master” card. No, thank you. This is one of the decks that I would love to make into a picture. The images are beautiful and like you, Dixie, like the direct answers you get with this deck. I don’t use this deck much… only on the time that I need a slap across the face reality check. Love the deck though.